Saudi Arabia says it has suspended dialogue with Qatar, shortly after a phone call between the Qatari leader and the Saudi crown prince. The two sides had discussed holding talks to resolve the Qatar crisis, which has seen Doha cut off from Saudi Arabia, Bahrain, Egypt and the UAE. However, Saudi Arabia then accused Qatar of distorting facts about the call, and said it was ending talks. The four countries say Qatar supports terrorism - something Doha denies. 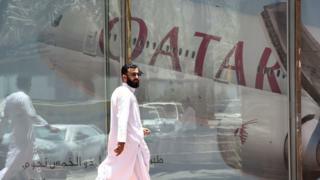 The row led to all four Arab nations cutting ties with Qatar on 5 June - Saudi Arabia closed its land border with Qatar, while all four countries cut air and sea links with the country. Friday's phone call, which came after US President Donald Trump spoke separately with both sides, had initially been seen as a possible breakthrough in the crisis. The call was the first formal contact between Riyadh and Doha since the crisis began. State media on both sides reported that Qatar's Emir Sheikh Tamim bin Hamad al-Thani and Saudi Crown Prince Mohammed bin Salman had discussed the need for dialogue to resolve the crisis. The Saudi Press Agency said Qatar's leader had "expressed his desire to sit at the dialogue table and discuss the demands of the four countries", and that further details would be announced after Saudi Arabia reached an agreement with Bahrain, Egypt and the UAE. Meanwhile, the Qatar News Agency said the Saudi crown prince had proposed assigning "two envoys to resolve controversial issues in a way that does not affect the sovereignty of states". Shortly afterwards, Saudi Arabia accused Qatar of not being "serious" about dialogue, and said communications between the two sides would be suspended. The row appears to be over protocol - observers say Saudi Arabia is angered that Qatari state media did not make clear that the call was initiated by Doha. Saudi Arabia, Bahrain, Egypt and the UAE, who are blockading Qatar, have presented a list of conditions for the lifting of sanctions. They include the closure of news broadcaster Al-Jazeera and reducing ties with Iran. The group accuses the Qatari-funded channel of fostering extremism, a charge the network denies. Diplomatic efforts led by Kuwait and backed by Western powers have so far failed to end the dispute. On Friday, Mr Trump spoke with both sides, and the UAE, in an attempt to broker talks. "The president underscored that unity among the United States' Arab partners is essential to promoting regional stability and countering the threat of Iran," the White House said in a statement. It added that "all countries must follow through on commitments... to defeat terrorism, cut off funding for terrorist groups and combat extremist ideology".